Recent release “Justice Awakened” from Page Publishing author Bruce Thompson is a thrilling work presenting FBI Special Agent Amy Johnson’s subsequent investigations regarding the murder of United States Assistant Attorney Daniel Franklin. 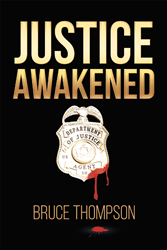 Bruce Thompson, a lover of mysteries and crime fiction who served in the Marine Corps, has completed his new book “Justice Awakened”: an engaging story dealing with a form of injustice committed by people in position that the public usually trust, like the local police. Published by New York City-based Page Publishing, Bruce Thompson’s entertaining work of fiction leads readers to enjoy an agent’s chase for those who used their credentials and badges to hide their crimes. The powerful writing also makes one appreciative of those who are willing to sacrifice their lives to expose injustices. Readers who wish to experience this thought-provoking work can purchase “Justice Awakened” at bookstores everywhere, or online at the Apple iTunes store, Amazon, Google Play, Kobo or Barnes and Noble.